My wife and I went to Raleigh this week. Since she is serving as pastor of a Lutheran Church now, not only did she have to go to the Moravian Synod, she also had to go to the Lutheran Synod. It was held on Friday and Saturday in Raleigh. They have Synod every year instead of every 4 years like we do. So they have it not at a conference center, but at a hotel. Even though I had no desire to attend another Synod, we were paying for the room, so I decided to tag along and just hang out. Thankfully I didn’t have to actually attend any meetings. Driving down to Raleigh on Thursday, I felt a little tug at my heart when, as we rode on I-40 through Greensboro, I saw the exit for 421 South towards Siler City. I remember taking that exit many times as a kid going to visit my grandmother. My dad grew up in Siler City and his mother (my grandmother) lived in Siler City all her life. When I was young, we would often go down and spend the weekend with her. There wasn’t a lot to do in Siler City. Those Saturdays were spent visiting my great aunts and uncles and riding by Aunt Bee’s house. After she retired from show business, Aunt Bee- from the Andy Griffith Show- moved to Siler City. So we would always have to cruise by her house when we were in town even though we never actually saw her. Those visits to Siler City were far from exciting, yet I remember always enjoying them. 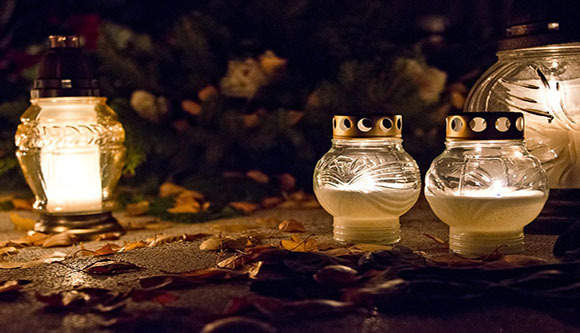 The best part came on Saturday evenings in the summertime, when my brother and sister and I would each get an empty glass jar, poke holes in the lid, and take it outside into my grandmother’s yard and try to catch lightning bugs. Her yard seemed to be covered with thousands upon thousands of those fascinating insects. We used to fill those jars with as many as we could catch and then we would shake the jar, just a little bit, to try to get them to all light up at the same time. It was a beautiful sight to see those little bugs making their own light shine, to see that light make that whole jar, even the whole night, shine so bright. Of course it had to be a glass jar. It wouldn’t have had nearly the same effect with any other kind of jar. Maybe we could have seen a little bit of the light shining out of the top of the but that is not nearly as good as seeing all the light, shining together. I was thinking about this as I was contemplating what Paul wrote to the Corinthians about the light of God shining in in our hearts and about how we have this treasure in clay jars, so it can be clear that it comes from God and not from us. I’m not really sure how keeping this treasure in a clay jar is helpful. It would be kind of like keeping those light’ning bugs in a clay jar. It would tend to be contrary to the whole point of it all. What’s the point of having treasure like that if you can’t even see it. Didn’t Jesus tell us not to hide our lights under a bushel basket? This seems like the same thing. It’s an interesting idea, keeping treasure, any kind of treasure, in clay jars. It doesn’t make much sense at all. Not now and it probably didn’t even then. When Paul was writing, a clay jar would have been far down the list of places where anyone would keep treasure. They are too fragile, too porous, too cheap- they are easily thrown away. They are even mentioned in the cleanliness laws in Leviticus. Where most things that come into contact with something or someone who is unclean can be washed and made clean again, a clay jar can’t. Once that happens it has to be broken and destroyed. That is how easily contaminated they are. And also how disposable they are. When I have a treasure, I want to keep it in something solid, strong, and permanent- basically the opposite of a clay jar. The RSV and KJV translations use “earthen vessels” instead of “clay jars”. I think that this is helpful. It helps me to not get so hung up on the whole literal image of a clay jar and see the deeper metaphor that Paul was using. Certainly a clay jar is an earthen vessels, it’s made from the dust and dirt of the earth, but there are many more things that also qualify as earthen vessels, including our own human bodies. I think that this is what Paul was getting it. WE are the earthen vessels, the clay jars, that the treasure is kept in. That makes a lot more sense. For we are certainly like clay jars, at least our bodies are. They are fragile, they are breakable, they are even disposable. And they are temporary. When Paul writes of keeping treasure in jars of clay, he is reminding us that God dwells in us. The God who created everything that is- the heavens, the earth, and life itself, dwells in our fragile, breakable, disposable bodies. This is the treasure that is in us, this is the light that shines out of the darkness. It is the light and the love of God. God made that light and love visible to humanity in the person of Jesus Christ. When God became human, when the Word became flesh and dwelt among us, the light began to shine in and through the darkness. The darkness that could not, and can not, and will not, overcome it. And we see the glory of God in that light, in him, the glory as of a father’s only son, full of grace and truth. We see that glory and that glory shines in our hearts as Jesus dwells within us. It is not us that shines, but it is the glory of God shining in us and through us. It is telling that Paul refers to this as an “extraordinary power.” I don’t think that he is referring solely to the power of the light shining in the darkness, though that certainly is an extraordinary power. I think that even beyond that the extraordinary power that dwells in us is the power of love. Love is why the Word became flesh, love is why God became human. “For God so loved the world that he gave his only Son, so that everyone who believes in him may not perish but may have eternal life.” God did it all because of love. God became flesh and dwelt among us because He loves us. God gave up all that he has and all that he is because He loves us. God then gave up the life He had taken on, He allowed himself to be shamed and humiliated, He allowed himself to be lifted up on the cross to die, because He loves us. “For God so loved the world…” That love represents an extraordinary power. I think that we get so caught up in the the first part, in the whole business of not perishing but having everlasting life, in our worry about our lives lived in these earthen vessels, that we lose sight of the second part. We lose sight of the love. It is kind of overwhelming to contemplate the idea, the fact, that the same God who created the heavens and earth and all the dwells in them, the same God who was and is and is to come, the same God who is all seeing and all knowing is also all loving. How can God look at the world, with all its faults and sins and hatred, and love it so much that he sent his only Son to save it? For that matter, how can God look at us, with all our faults and sins and selfishness, and love us so much that He became one of us, and allowed himself to die so that we might have eternal life? How can God love ME so much that he died for me? Yet that is exactly what God did. The truth that God came to us and Jesus died for us tells us that the extraordinary power of God that dwells in us is LOVE. These clay jars, these earthen vessels where we keep this extraordinary power, well they are meant to be broken. I don’t mean that our bodies are necessarily meant to be broken, to be injured, to be hurt, even though they are fragile and those things happen to them all the time. What I mean is that they are meant to let the light shine, to let the love out, to let loose the extraordinary power that dwells within them. Because even though our bodies are only temporary, the light of the love of Jesus that dwells within them is eternal. And it needs to be seen. So even though we are afflicted in every way, we are not crushed; we are perplexed, but we are not driven to despair; we are persecuted, but we are not forsaken; we are struck down, but not destroyed. This life that we live is hard, but it is not our only life. There is something more. We are something more than these earthen vessels, these clay jars. We have the light of God in us. We have the love of God in us. We can let that light, that extraordinary power of the love of God that dwells in us, we can let it out. We can let it out of these earthen, temporary vessels, and we can share it with the world. Because we know that no matter what, one day our perishable bodies will put on imperishability and our mortal bodies will put on immortality and death will be swallowed up in victory. Death is at work in us, but the life of Jesus, the love that dwells in us and the light that shines through us is greater than death and has overcome death. Brothers and sisters, We are not jars of clay but we are jars of light. Let your light shine and let the love of God that dwells in you, break free so that it can bring light and love into this dark world. Until he comes.